Take six formally trained jazz musicians, add three quick-witted emcees, sprinkle in some funk and soul, shake & serve and you have the tasty sound of Yo, Flaco! With an irresistible blend of deep, funky grooves, introspective lyrics, and live shows grounded in crowd participation and improvisation, Yo, Flaco! is the Denver based, genre-bending hip-hop ensemble that has been blowing minds from coast to coast for the past 6 years. Following in the footsteps of such innovators as Tribe Called Quest, Jazzmatazz, and the Roots, Yo, Flaco! is a forward-thinking group that moves hip-hop ahead while still remaining accessible to lovers of all kinds of music. In this way, Yo, Flaco! is certainly a breath of fresh air – producing a truly original sound while simultaneously creating music that is immediately memorable. The band started with a chance meeting between guitarist Brandon Martin, who moved to Denver after spending several years in Atlanta and keyboardist Matt Piazza, who had just finished college in Denver. Both shared a vision of creating a live instrument-based hip-hop group that would rock dance floors and the minds of music aficionados. The two began to hit jam sessions, emcee battles, and placed ads in local papers until the roots were laid for what would evolve into Yo, Flaco!. The lineup was eventually rounded out by Berklee graduate Wes Coplen on bass and Seth Murphy (a disciple of Dennis Chambers) on drums. The funky rhythm section is punctuated by the “Flaco Horns” consisting of Ethan Raczka on saxophone and flute and Adam Bartczak on trombone and conch shell. Both are graduates of the Jazz Studies program at the University of Colorado in Boulder , and they share a unique take on arrangement and harmony. The emcees consist of Neil McIntyre, Nate Graham and Derris Miles, all three local legends in the Denver hip-hop scene. 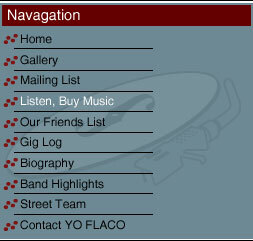 In addition to their work within Yo, Flaco! the three have been freestyling their way through a maze of state-wide & national competitions and have won several. Showing that they are every bit as accomplished improvisers as the instrumentalists in the band. Each emcee possesses a unique way of phrasing and writing, the combination of the three is electric. Once the group was formed, the reaction from fans was instantaneous. With the release of their first CD Skeptamistic, they were named “The Best Unsigned Band in America ” by Jim Beam. When their second album dropped Goin’ At It, an American Music Award nomination followed. With their latest release entitled, The Skinny ( featuring Ron Miles on trumpet and production by Alan Evans of Soulive ), great things are expected! Yo, Flaco! has shared the stage with G. Love and Special Sauce, Tower of Power, Ozomotli, Soulive, Robert Walter’s 20 th Congress, Pete Rock, Sage Francis, Blackalicious, KRS-1, Tonic, Galactic, Maktub, and Groove Collective to name a few. They are packing shows up and down the West and East Coast. Catch ‘em in a small venue before it’s too late.